Bunny (aka grav3yardgirl) is a Youtuber in the US. She does videos on a variety of different things, the most popular being “Does this thing really work?”, a series where she tests out “as seen on TV” items. 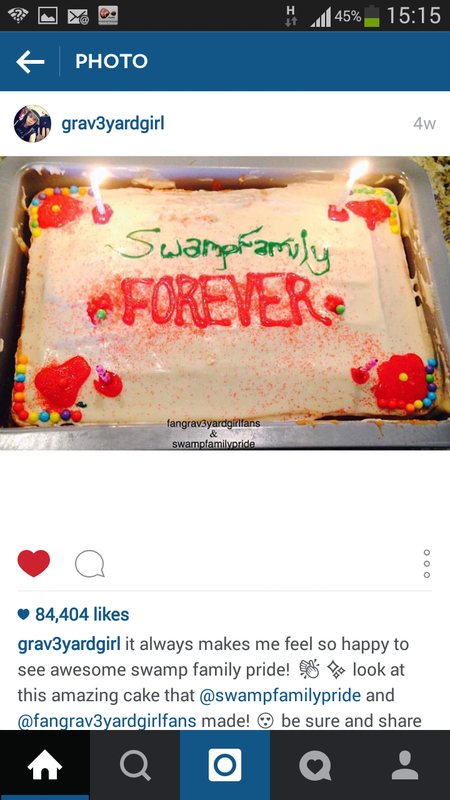 She has over 5 million subscribers and a loyal following she calls her “swamp family”. I love Bunny because every time I watch one of her videos, it makes me want to get moving and start writing. She is spending her life being creative and doing something she loves. I wish I could emulate her work ethic – she posts 5 videos a week, and it is clear that she is doing something she loves and is passionate about. She ends each video with “I’ll see you guys tomorrow”, knowing that her army of loyal fans look forward to and depend on the regularity of her videos. There is obviously a lot of trust between her and her fans; although in some videos she has a full face of make up, more often than not she wears none at all. This is one of the reasons why I, and so many others, relate to her – she is always real, unpolished and personal; making self-deprecating jokes and letting her fans know she is just like them. Reading through her comments on her videos shows how many people see her as a friend, someone who makes them feel less alone. Her quality that touches me personally the most is her openness about her anxiety – she talks about it easily and without shame. In one of her videos she tested an “instant plastic surgery” device that involved her putting on a mask that shone lasers onto her face, which scared her. She went off camera, returning to tell her viewers that she had had a panic attack and had needed to talk to her boyfriend to calm down. She could easily have edited this part out of but she didn’t. Instead she was honest with her fans – and making those with anxiety, like me, feel better for seeing someone they admire be so honest. What is it Really Like to Live with Anxiety? I feel many people have misconceptions about anxiety. I cringe internally when people at work say “ooh, I nearly had a panic attack”. But I can’t blame them. Before I was diagnosed I knew very little about anxiety. I had heard of people having panic attacks on occasion, but that was about it. But now I can’t bear to see how anxiety is shown in the media. The examples given most often are introverted teenagers in hoodies avoiding social situations. It also always seems to be mentioned in the same breath as depression, and is seen as the less serious sister of the former – because everyone worries, right? But it isn’t just worrying a lot. It isn’t being an introvert, or being shy. You can lead a perfectly happy, functional life, with a job and friends. But suddenly, out of nowhere, this unknown force inside of you, “anxiety” plunges you into a different world. You feel dread without knowing why. You feel sick, scared and want to curl up in a ball. You have no idea why you feel like this, but you convince yourself there must be a reason, something bad must have happened, or will happen, because otherwise why would you feel this way? You can’t understand how you can go from self-assured and confident one moment, to feeling like everything is spinning out of control the next. The world is surreal – it is happening around you but you aren’t a part of it. You are looking at everything from behind glass. You are trapped in a nightmare. Anxiety isn’t just “worrying too much” and a panic attack is much more than having to breathe into a paper bag. It is something much, much more than that. That’s where I caught her eye. Common People by Pulp is one of my favourite songs. If you haven’t heard it, it describes an encounter the singer/songwriter Jarvis Cocker actually had with a girl he met, who told him she wanted to “live like common people/I want to do whatever common people do/I want to sleep with common people/I want to sleep with common people like you”. It’s a good song to dance to at a party, but it’s also full of emotion and anger. It’s full of anger with the girl in the song but also with all those like her. Those who “will never understand/How it feels to live your life/With no meaning or control/And with nowhere left to go”. But even when I was drunk and belting out the words, I always felt an uncomfortable twinge – almost of guilt. Because I didn’t feel I was “common” enough to be singing the song so angrily. The song tells the girl that if she wants to be common as she declares then she should “rent a flat above a shop/Cut your hair and get a job/Smoke some fags and play some pool/Pretend you never went to school”. This describes the sort of life I never knew growing up. I’ve never smoked, playing pool infers spending the weekend in the local pub which is not my thing, and I most definitely went to school, in my Clarks shoes no less, the ultimate symbol of being a middle-class goody-two-shoes. Now I’m older, however, I feel I’m a little more qualified to being “common”. I realise how little money my parents had while I was growing up, despite our big house – all of our clothes were from car-boot sales, or hand-me-downs. You can trace the same outfits in old photos from my oldest cousin, to my older sister, to me, and finally, very worn, to my little sister. I also definitely felt poor (if, as the song suggests, you must be poor in order to be common) when I was a student, and I’ve scraped by on benefits several times since leaving uni. Now I’ve written all of this down, I realise what a bizarre notion it all is. I don’t know if this is the same in other countries, but in the UK growing up there was a fine balancing act you had to maintain in order to be seen as ‘cool’ – to have enough money to buy every new trend, but not so much you were seen as ‘posh’. As the song says, some people “think that poor is cool”. Clearly I must be one of them – even if purely because I felt it was something I was excluded from. So what does it mean to be “common”? Is it just another word for “poor”? Or “ordinary”? I searched the internet for answers. Most definitions were negative – “not rare”, “without special rank or position”, “falling below ordinary standards”, “lacking refinement”, and for the phrase ‘common people’: “characterised by a lack of privilege or special status”. The more positive ones emphasised a sense of sharing and belonging: “belonging to or involving the whole of a community or the public at large”. The example given is common land, but I wonder if the same can be said of a public mentality? Maybe being “common” simply means “one of the people”. Maybe you are only “common” if you feel you are. I have been thinking about all of this even more so recently because of the recent UK election result. The Conservative party won. The kindest view of the Conservatives is that they are well-educated with a focus on the economy and a good financial plan. The harshest is that they are privileged, rich, predominantly white men who don’t care about ordinary people. I tend towards the latter view. Despite being devastated by the election result, I felt such a sense of solidarity with the people around me – my Facebook feed was full of people with the same view as me, there were riots outside Downing Street, and the North was (and still is)clamouring to join the more liberal Scotland. For once I did feel “common” – just part of one group who were truly angry against a state that didn’t understand them. And that is the feeling that Common People gives you – especially when you’re all out in a big group, shouting the words. It’s a song that makes you feel that it is us and them. 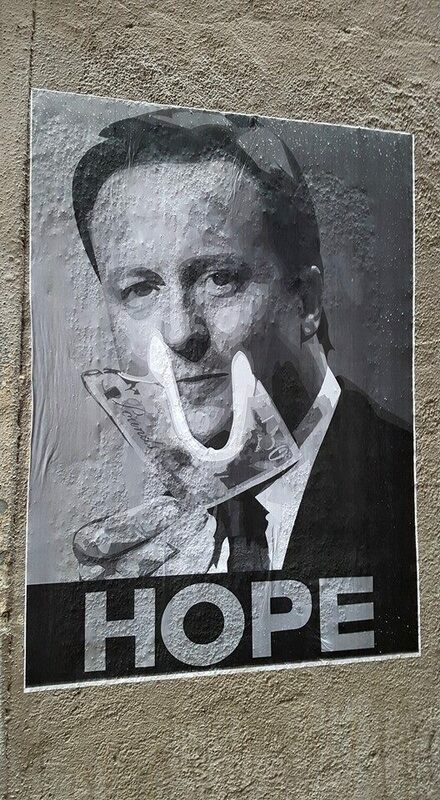 Poster of David Cameron burning a fifty pound note in Manchester. But who are them? The rich? The successful? And if so, what does that make Jarvis Cocker now? Pulp sold over 10 million records, and Cocker has since done well in several areas, including having his own BBC Radio 6 live slot. Does he still feel like a common person? I also wonder about J.K Rowling – now a billionaire, Rowling is still a Labour supporter, vocally and financially, and it is clear from her interviews she still holds close the times when she was poor, a single mum and trying to get Harry Potter published. So is being common just a state of mind? My grandma, who was a teacher and married to a head teacher, and who also now has a comfortable pension with a large house, grew up in a poor Northern factory family. Five minutes of conversation with her and it is clear she still associates herself adamantly with the North, and the working class. So, what does it mean to be common? Is it just a lack of money? Or a state of mind? Or a political stance? I suppose the whole dilemma is similar to one we all face: wanting to be unique, special and individual, but desperately wanting to fit in. Wanting to show the world how talented you are, but not wanting to lose that sense of belonging with those around you. As for me, I realise this is a much more tangled and complex argument than I originally thought. But I won’t feel guilty listening to Pulp again.